Earth, Air, Fire, and Water combine in unique ways to create each heavenly body in the cosmos and all that exists on earth. They connect us to our Selves, all that is around us, & the Divine. What can each element teach us? How does our sacred connection to each element deepen our relationship to our Selves and those around us? How can we weave together the wisdom of the past and the wisdom within to find the balance we desire? 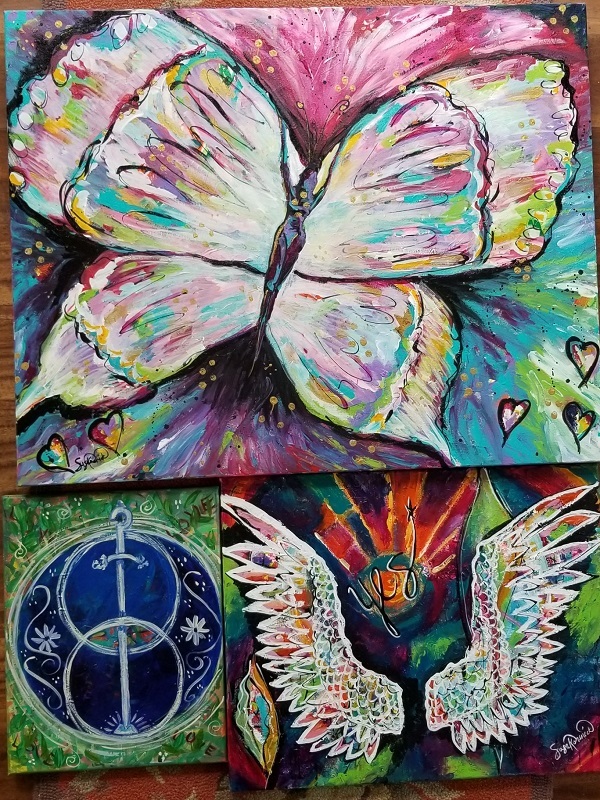 Susan Korsnick is offering a 5-part (one class for each element) intuitive painting series to nurture a more intimate relationship with each element and your Divine Elemental self. You may come to as many of the classes as you like. 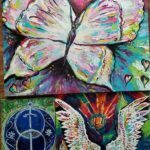 Susan will lead us step-by-step through the intuitive painting process, continuously helping us to connect more deeply to each element within ourselves. The layering of words, colors, and marks turns the canvas into a portal. Through this portal, your personal images will reveal themselves. This experiential class will include rituals, sound, movement, & guided visualizations. Cost for each all-day class is $75 in advance, $85 on the day of class. You may register in advance for all five classes for $325 ($65 per class). Further details on the focus of each class, and the schedule for the classes is on the back of this flyer. No experience is necessary. All art supplies and materials will be provided, including a canvas. Bring your journal, lunch, snacks, and drinking water. Dress in layers, and consider bringing warm slippers! Classes will be held at Radiance, 9 W Grant St. To register, stop in or call 717-290-1517. Susan Korsnick is an artist, educator, workshop facilitator, and Creatively Fit Coach. With over a decade of experience leading creative and spiritual events- such as art retreats, women’s spirit circles, and Red Tents, Susan is honored to hold sacred space for those on a path of self-discovery, empowerment, and deeper spiritual awareness. Susan has traveled “the long, scenic route” on her path of self-awareness - studying many traditions and exploring many methods along the way. For her, the journey back to her authentic self was made easier when she allowed Intuition and Creativity to guide her. And now, she acts as a Wayshower and Uplifter for those traveling their own spiritual path back to Self. In this session, we will call on the element of Fire for Passion. Fire is the symbol of creativity, the will, love, sexuality, strength, courage, action, & power. Connect to Divine Feminine energy represented by goddesses of the sun, volcanoes, ritual fire, hearth fire, creation, & destruction. Connect to the energy of phoenix, dragon, snake, coyote, & fox. But most of all, connect with your Divine Elemental Self. In this session, we will call on Spirit. Spirit (Ether) is the symbol of presence, the changeless, space, connection, joy, balance, harmony, soul, and union. Connect to Divine Feminine energy found in the Lady and Queen- empowering and loving. Connect to the Mystery and the Void. But most of all, connect with your Divine Elemental Self.